The new LAVA eSTS-E, eSTS-PE, eSTS-2UE, eSTS-P2UE, and eSTS-3U products are being introduced in 2017 to provide the extended features of the LAVA RBM Technology in the same form factor as the classic STS** products. The first few devices were added to the company website in April 2017, and additional products will follow in the months to come. LAVA fell into the world of Samsung tablets in late 2013. We were surprised to find that only Samsung tablets could operate as a USB Host while being charged. The ability to charge a tablet while talking to a USB device had great interest at that time as a low-cost touch sensitive control panel. Several custom projects were developed using Samsung Tablets along with USB peripherals during the following year. These custom projects evolved into the STS** Product Family, which included the STS-E, STS-PE, STS-2UE, STS-P2UE, STS-3U, and STS OEM Board. 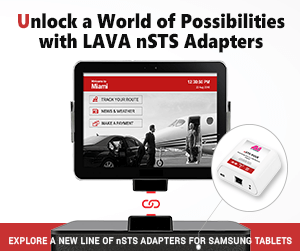 The original STS**products were introduced in late 2014 and continue to be available. LAVA’s knowledge of working with Samsung Tablets has grown significantly since 2013. The LAVA STS-RBM Tablet Kiosk was released in early 2016 and incorporates all the enhancements discovered since 2013 for long term deployments. 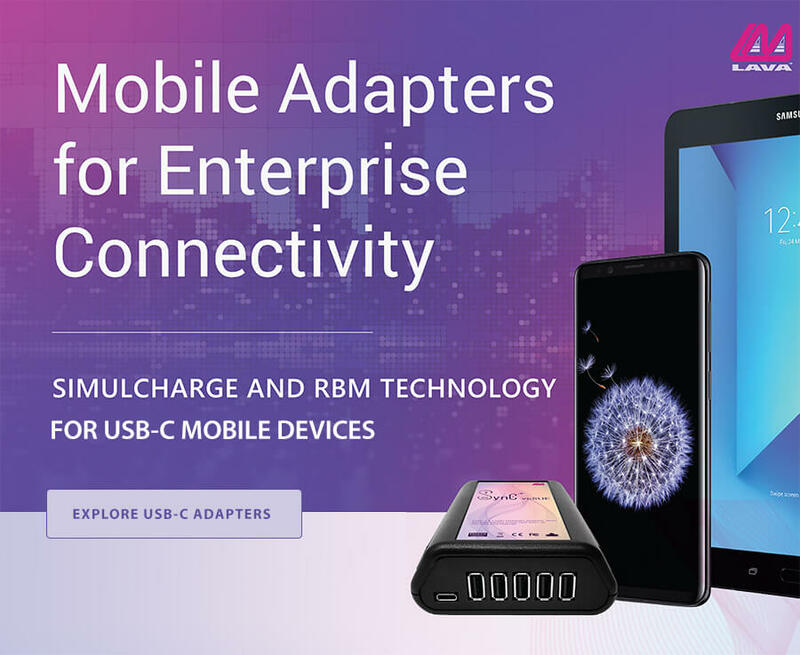 A background application running on the tablet manages enhanced features such as Battery Modulation, Network Recovery, Screen Brightness control, and Maintenance Reset control. The product also supports a firmware update mechanism to allow customization and feature improvements. All features work on a non-rooted tablet, which is a crucial requirement for many of our customers. The new eSTS-E, eSTS-PE, eSTS-2UE, eSTS-P2UE, and eSTS-3U incorporate all STS-RBM improvements. 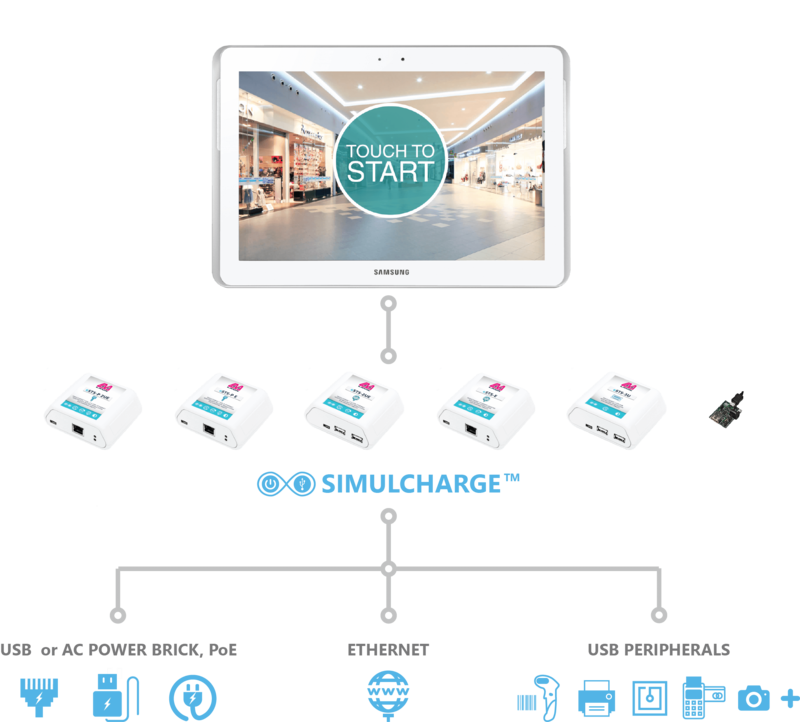 Charging a Samsung tablet while interacting with USB peripherals remains the primary feature of all eSTS products. The addition of Battery Modulation is the most significant enhancement to the product line. Many people are beginning to realize the issues involved when using Lithium-Ion batteries. Battery Modulation automates the process of charging the battery up and then allows the battery to discharge between two configurable thresholds. The battery never remains at the 100% level for more than a few minutes per month. 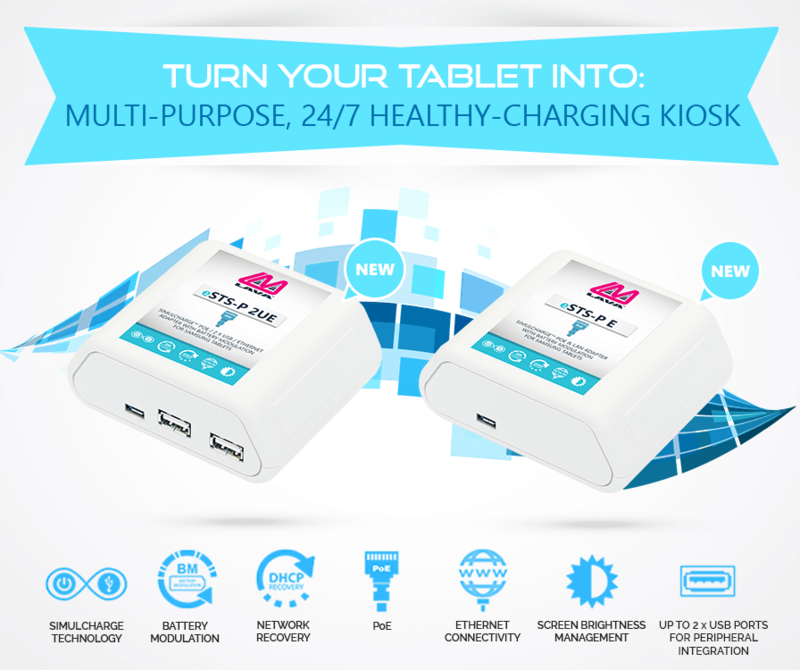 The modulation feature extends the operational life of the tablet. 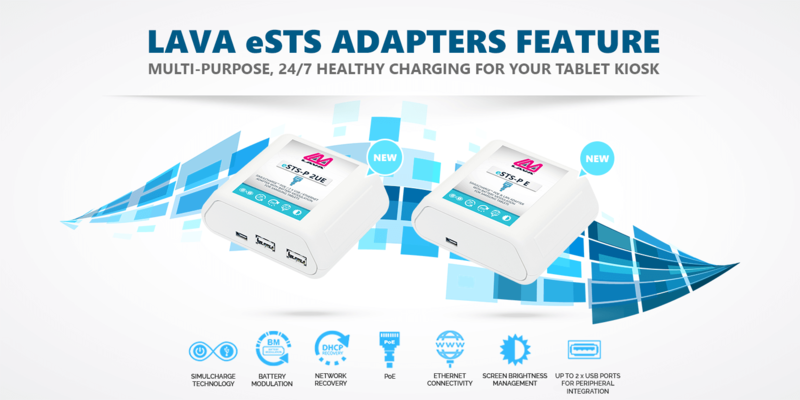 The eSTS Family core features are also available on the eSTS-1U-OEM and eSTS-BM-OEM, which are single-board devices intended for system integrators. Both boards work with the same background application as the other members of the eSTS family. The STS-1U-OEM provides a single USB 2.0 receptacle, while the eSTS-BM-OEM is available for systems which do not require USB peripherals. These boards are ideal for integrators developing electronic signs or WiFi based enclosures. The “eSTS Product Family – Reference Manual” describes all eSTS Family features. The “eSTS Installation Manual” describes how to prepare a tablet with the application which manages the extended features. The “LAVA RBM Technology” white paper describes the background for each of the core features that make up the technology. The LAVA website contains copies of these documents along with related product information. I have a TL-002 that will only provide device ACCESS and CHARGING otg function with a “non” adaptive Samsung CHARGER. What do you recommend I use for a Samsung Tab S2 9.7″ if I want to use an “adaptive” CHARGER? The non adaptive chargers are difficult to find. have the new ests products overcome this issue? is the tl-002 redundant or not being manufactured anymore? any advice would assist greatly.